Typically I only read one novel at a time. 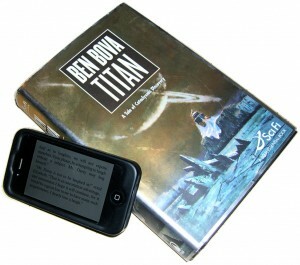 At present, however, I am reading Ben Bova’s Titan as well as Jane Austen’s Pride and Prejudice. These novels are sufficiently distinct that I don’t think I’ll have any trouble keeping the stories straight – although both are certainly set in alien environments. Fortuitously, both books have short chapters, making it feasible to alternate between them whenever I sit down to read. My hope was that these books would complement each other as part of a balanced fictional diet. Titan has big ideas and a technically intriguing setting, but, admittedly, its characters perform like cardboard character actors (a risk of its subjective yet superficial third-person perspective, I suppose). An exception is Titan Alpha, the rover whose misbehavior is the most interesting enigma I’ve encountered in the story. Titan Alpha is a viewpoint character. I like it when a character cracks a joke and it still seems fresh despite the knickers and two hundred year old diction. Pride and Prejudice portrays people with much more nuance, although they are all perhaps a bit too snooty to earn much sympathy from me. (I realize that this impression may well be intentional, given the title.) What I like most about Pride and Prejudice is the language – the sentences themselves exhibit a variety of structure that is a pleasure to unravel, yet never too baroque to understand. I like it when a character cracks a joke and it still seems fresh despite the knickers and two hundred year old diction. Whether it is Austen’s own style or simply English of the era that I enjoy, I cannot say. I’m only about a quarter of the way through each book, so the impressions above shouldn’t be construed as final reviews. Mainly, my intent is to compare what I’ve noticed in the process of alternating between books. So, do you ever select books based on what you perceive to be their complementary properties? Are you a gourmet, seasoning your reads with sweet and sour, or is your mind a furnace into which you must shovel as many ideas and experiences and as possible? Posted on Tuesday, September 18th, 2012. Tags: books.